You will most likely need a new roof when you see water coming through your ceiling, or your old shingles have lifted in places or curled up. Most shingles for roofs have a twenty to twenty five year life span, depending on the quality. With todays climate change and the sunlight in summer seems to be hotter it would be a good idea to check your roof every three or four years. 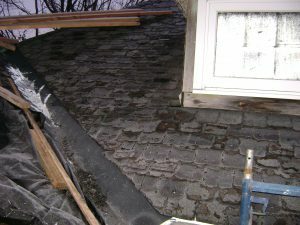 If you find the shingles lifted or curled up, then is close for a renew time. If you wont to do this yourself then with a two story house is best to set up some scaffolding to work safely on, as a twenty or so foot drop is not always good for the body. Or you can just hire professional roofers to do it for you. In the case of this roof the level was down in the middle so the rafters were sagged down. After removing the shingles and plywood and boards on this old farm house roof, we could see places that had rotted through. Some of the old rafters were three feet apart, but that measurement varied from rafter to rafter. Actually the roof looked like it had been built with second hand lumber, so I suppose a hundred or more years ago it was not as easy to get quality building materials, or just a lack of money at the time. Some rafters were two by fours and others were four by fours, seemed to be no set standard. 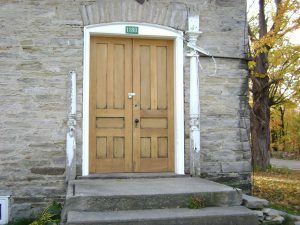 If you come across a situation like this then is best to put in some two by sixes to strengthen and straighten the roof. You can run a line from one end of the peak to the other end getting it as level as possible, and use it as a reference to put your rafters up to. 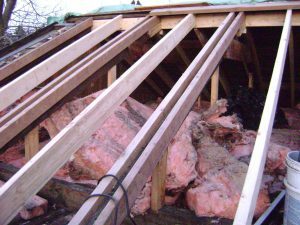 If the roof is not sagged to much then you might be able to sister two by sixes to the old rafters, or also put new two by sixes between the old rafters for extra support. If you happen to have any bathroom vents coming into your attic then is a good time to connect there venting to the outside, as they will be easy to work on with the roof off. 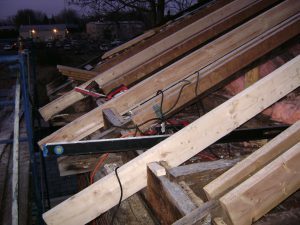 Once all the rafters are up in place and level across, then the boards can be put back on and new plywood before installing your new shingles. Then any roof vents can be cut out and new flashing put around chimneys, vents or valleys if any. Then the drip edge and underlay can be put on. The underlay can be felt tar paper or the new self adhering underlay. The self adhering is an excellent product for shingle roofs, adding extra protection from leaks, and the rubberized asphalt seals around nails driven through it from the shingles. Also would recommend it along the peak, under flashing around vents and chimneys, and in valleys before applying the shingles. Dewalt drills 20 volt batteries. Levels- 6 and 2 foot. Hope this left you with a few ideas for repairing rafters in an old roof.